Earlier this year, before I had heard any of The Blessed Curse, I had a crazy dream about Manilla Road, in which band leader Mark "the Shark" Shelton played a show in a small room for an older crowd of non-metalheads, with a set composed of softer songs to avoid destroying everyone's hearing. As it happened, the dream was somewhat prophetic. There are more soft and acoustic songs on The Blessed Curse than one would expect; in fact, they comprise almost fifty percent of the album. But that's not a sign that Manilla Road is getting soft. A throwback from the Mesozoic era of American heavy metal, Manilla Road combines a dreamy, psychedelic aesthetic on The Blessed Curse with more ferocity on the heavy songs than they were able to summon up on the last album. Most importantly, this is an album that Shelton appears to have worked on more than he did the last time around. Dealing with songs in the hit-and-miss collection of Mysterium, with similar-sounding choruses and weaker riffing than what Manilla Road fans are used to, can be an uncomfortable experience -- even though there are some true epic pieces on that album towards the end. On The Blessed Curse, on the other hand, each song is its own step in the epic concept the album forms. Starting with Shelton's opening invocation to his muse like an aged bard of heavy metal, the album moves through a series of ripping, bass-heavy thrashers that alternate with clean-picked atmospheric ballads. The riffs and solos are back, so everyone can breathe a sigh of relief; on Tomes of Clay, it's almost all solo, with Shelton showing that he can play Middle Eastern-style leads just as well as any Orphaned Land guitarist, applying his own unique licks. Even the sometimes-OK, never-amazing vocals of Bryan "Hellroadie" Patrick don't drag the album down. To be perfectly honest, I've never been able to love Hellroadie's singing, and if he'd stuck to his old job of hauling Marshall stacks on and off stage, I wouldn't consider it a great loss. But on this one, singing on mid-range pieces such as Tomes of Clay is more of a fit for his vocals. The rest of the time, the band wisely either lets the guitar do most of the talking or puts him in the position to sing harmonies. Most fans would be perfectly happy with the first ten songs the band handed out, but this album is a double album, the second disk giving us a showcase of acoustic tracks, many of which fit the preceding songs' theme. In the same year, Shelton released an acoustic rock album under his own name, and some of the songs on this disk remind me of that one. For those who aren't as interested in the Shark's acoustic side, In Search of the Lost Chord, a collaboration with Doomsword guitarist Gianluca Silvi, contains a nice solo. But my favorite on this disk is a rehearsal recording of an unreleased track called All Hallows Eve, a Metal-era measured piano/guitar rhythm that builds up to a stripped-down, high-speed blaster; a 22-year-old Mark Shelton wails out the vocals. To give listeners some historical perspective, a rerecording with the current lineup is included as well. 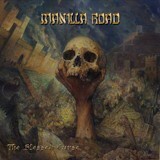 Manilla Road continues on The Blessed Curse with no sign of slowing down the output (they just released another album this year), satisfying listeners' need for some serious epic metal while still letting Shelton indulge some of his other musical interests on the same release. The Shark may be getting old, but he clearly hasn't lost his teeth just yet.